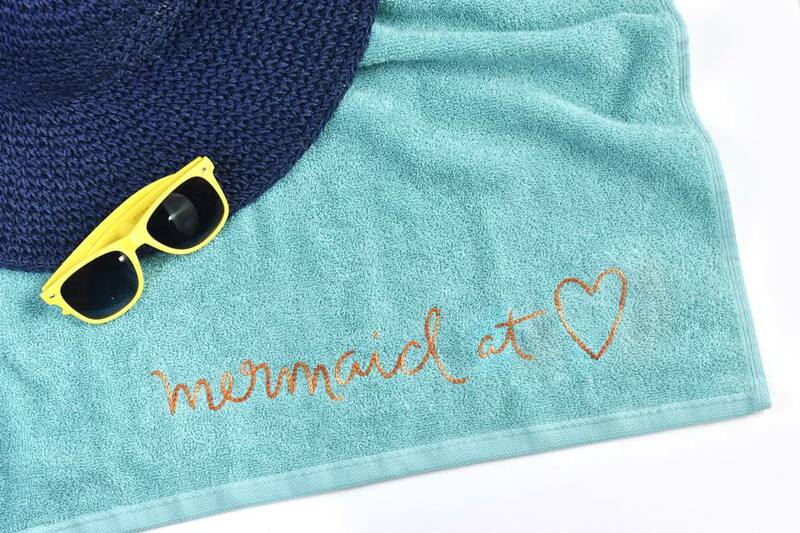 Customize your beach towel with a stitched sun and water phrase that's perfect for spending a day seaside or at the pool. Learn how to embroider on terry cloth towels without snagging them and fill your summer with stitching fun in the sun! Start with a basic towel, then add one of our five free patterns to transform that towel into something special. Extra large towels are great for adults, but regular bath towels work well for kids. You could even give an older towel a bit of a boost! If you want to adjust the phrases slightly, cut out a word or two, or combine a few words from the different patterns. Or create your own design by writing out a few words or enlarging another summer pattern. Ready to start your summer stitching? Customizing a towel with hand embroidery is easy, and you only need a few supplies. Some beach towels feel more velvety, while others are closer to bath towels. Either works for this project. To prevent uneven shrinkage after stitching, pre-wash and dry the towel. To stitch a summer phrase at the size shown in the sample, download one of the large patterns below and print it at 100%. You can also enlarge these further on a copier and then tile them together if you want a design that runs the length of the towel. If you want to stitch one of these phrases on something smaller, download the JPG with all five patterns. When embroidering on a beach or bath towel, the tracing paper method works best to mark your pattern. Trace the printed pattern onto thin tracing paper. If you want the phrase to be all on one line, cut the pattern into strips. Before you start stitching or even basting your pattern, you should know how stitching on terry cloth is different from stitching on standard fabric. Although it doesn't happen every time, the needle and thread often pierces the fabric and then comes through one of the tiny loops on the surface of the fabric. When this happens, the loop can get caught and then it pulls, leaving a larger loop on the surface. It doesn't ruin the towel, but it also doesn't look so good. To prevent the fabric loops from pulling or snagging, use your fingernail to hold down the fabric as you pull the needle through. Be sure to hold it against the needle so the needle and thread can't tug at the fabric. You need to take this extra step on both the front and back of a looped towel. But as you work, you'll get used to it and it won't add much time to your stitching. Use regular thread and your ball-point needle to baste the tracing paper pattern to your towel with long stitches. When working with multiple pattern pieces, overlap the ends to get the correct spacing and try to keep the line of text straight. Begin stitching through the towel and the tracing paper, holding the fabric down through the tracing paper. Use a large stitch, such as reverse chain stitch, and perle cotton. The goal is to create a strong line of stitching that shows up well. You can also stitch multiple lines of back stitch, or if you are stitching with an enlarged pattern, you may want to work side-by-side lines of chain stitch. For extra large stitching, you can even embroider with cotton yarn. After you finish all the embroidery, gently tear away the tracing paper. Tear the paper along the stitching lines without pulling at the stitches. When small bits of tracing paper get stuck under the stitches, remove them with a tweezer or by working them out with your needle. Once again, take care not to pull at the fabric loops as you remove the paper pieces. Roll up your towel, grab some sunscreen, and head to the water!